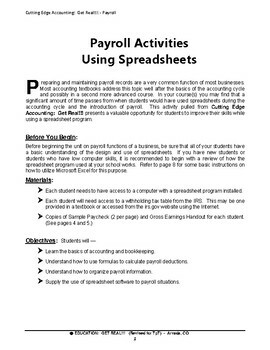 ACCOUNTING & FINANCIAL LITERACY – "Payroll Activity Using Spreadsheets" is an activity just your accounting students, and it enhances student learning by using spreadsheets to track payrolls - all a part of the accounting cycle. This activity is included in the “ACCOUNTING & FINANCIAL LITERACY “Monopoly® - Reinforcing Accounting Principles” BUNDLE also offered here in our store on TpT. PLEASE IMPLEMENT THIS PRODUCT IN YOUR CLASSROOM BEFORE Y0U RATE THE QUALITY AND JUDGE THE CONTENT. OTHERWISE, IT IS UNFAIR TO THE AUTHOR WHO HAS SPENT COUNTLESS HOURS PREPARING A HIGH-QUALITY PRODUCT TO SAVE YOU TIME, WORK, AND $$$$'S! IT ALSO GIVES YOU THE OPPORTUNITY TO PROVIDE THE AUTHOR VALID AND VIABLE FEEDBACK SO THEY CAN IMPROVE AND UPDATE THE PRODUCT TO MAKE IT BETTER FOR STUDENTS. EGR ALWAYS STRIVES FOR EXCELLENCE IN EDUCATION. We thank you!Would you like to bring more technology into your accounting class(es)? Why wait for the textbook to introduce payroll to your students? Why not use the computer and introduce payroll (out of order) so that your students learn how to incorporate payroll into the accounting cycle? 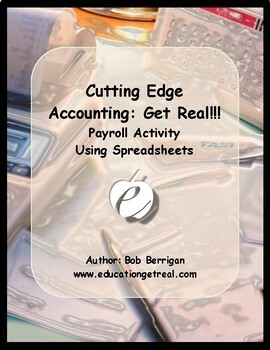 Then, the Cutting Edge Accounting: Get Real!!! Payroll Activity that incorporates spreadsheets is just what you are looking for! This payroll activity includes instructions on how to teach the payroll process using the spreadsheet program that your school currently uses. Most accounting textbooks introduce payroll long after the basics of the accounting cycle has been learned. 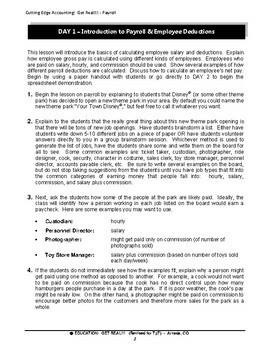 This payroll activity will introduce the basics of calculating employee salary and deductions at any time the teacher chooses to introduce it. 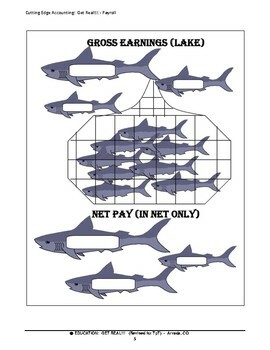 The activity presents the different ways that employees are paid – hourly, salary and commission. This three-day payroll activity gives the teacher complete instructions and activities to present to students for building and inputting payroll information onto a spreadsheet that they have created. Listed below is a link to another component that fits very nicely with the Cutting Edge Accounting BUNDLE plus a link to the BUNDLE, both which may be of interest to you as well. Click the item to open the link in a new window. We also produce a company newsletter so you may sign up for that on our website as well. Check us out – our EGR “Materials are Created BY Teachers FOR Teachers!"